Are you looking for a way to add interest to your Old Testament lessons? Do you want to add more games and captivate your students’ attention? Are you searching for a project which integrates learning and technology? 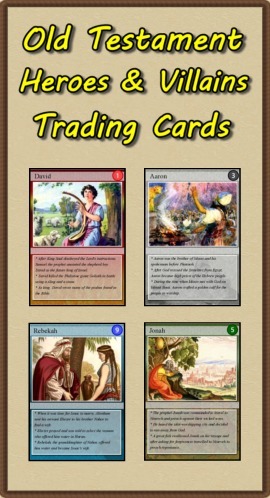 Download my Old Testament Heroes & Villains Trading Cards package! Included is a set of 54 trading cards summarizing the lives of Old Testament heroes and villains. These trading cards can be printed on card stock, laminated, and trimmed to produce a set of playing cards. I am constantly finding kiddos standing in front of the bulletin board soaking up new facts. 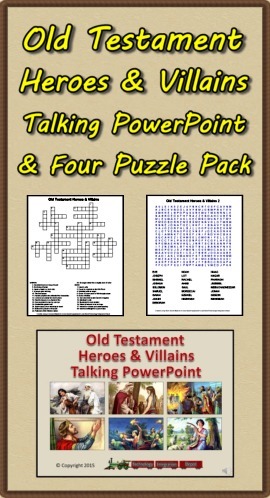 Turn down the lights and turn up the volume for the Old Testament Heroes & Villains Talking PowerPoint! This slideshow highlights 48 Bible characters found in the Old Testament. Each slide is narrated so the slideshow can be presented in a Sunday School, Vacation Bible School or classroom setting. Also included are two crossword puzzles and two word searches basic upon facts found in the presentation. Answer sheets are included.